B: Antelope is one of my favorite fruits. B, after watching Pooh’s Heffalump Movie: So, I guess there’s a Pooh’s Woozel Movie. B: Who’s your favorite person in Star Wars? B: Coughing is a good sign of something bad. B: There’s two bags of pretzels in here. One is unopened and the other one isn’t opened. B: Mama, can you come help us find the Lego piece? You have sharp eyes. What does “sharp eyes” mean? Blake saw blue lights flashing up ahead. B: What are they doing? Me: They have someone pulled over. B: Why? Did they make a u-turn? B: Did Jack’s voice used to be like mine? B: so why does his voice sound different now? B: So your voice used to be cute? J: Wait a minute! If cockroaches can survive a nuclear explosion, what the heck is in those spray things? 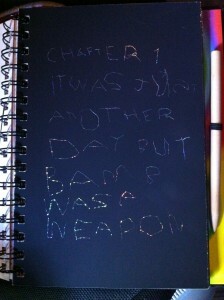 Blake has started writing his first story, which is apparently a chapter book. Ambitious *and* weird. He’ll make a great writer. B, after licking J: Don’t lick me! J: Don’t be a hypocrite. B: Mama! He called me a hitafit!